We recently bought new white bedding that by the way I am loving. Now we just need a new bed frame which we have decided to make ourselves. While looking for bed frame inspiration, I came across this photo and beautiful headboard idea. There are so many uses for vintage doors. I have seen doors used to make desks and tables but I think that this headboard is my favorite use so far. Using vintage doors in your home decor is also a great way to "go green" and use something that would otherwise be useless. Do you know of any other good ways to recycle vintage doors or windows? That is gorgeous! Are you going to do that for your headboard? I love the idea of using old windows to display jewelry or just to hang on the wall. Dreamy Whites is my FAVORITE. I'm obsessed with Maria's home! 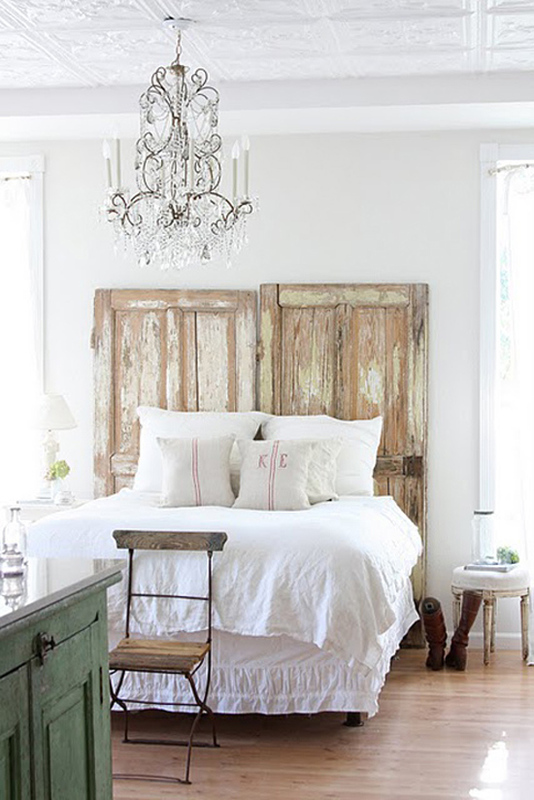 I have white bedding as well, and I have been looking for inexpensive doors that I can age and use as a headboard. Love this! I love this!! I hope you post pictures of your finished room! My friend uses old windows as picture frames and I've also seen them used as a dry erase board, using the glass. We made a picnic table out of an old door at our cabin. I've also seen them made into coffee tables. If you cut them into two (longways) and put a hinge on them you could have panels to divide a room. Stephanie, I will hopefully be able to do something like this, I don't actually have any vintage doors but hope to find some at a local market or something...wish me luck! I absolutely love old vintage doors and would probably use them for everything if I could! I've always liked the chalkboard-day-of-the-week use like this http://donation2decor.com/door/Images/Desk.jpg, but they would make a great headboard. I love vintage windows that are turned into mirrors. Does that make any sense? The small-paned windows are all replaced with little mirrors and the entire frame is hung on the wall. Also, a friend of a friend made a kitchen table out of an old, vintage door. Apparently it was the coolest thing ever. Sounds like it! Anyway, I love the headboard idea! Our headboard is a door too! Thanks to my ever creative husband who never runs out of DIY ideas! It’s always fun to recycle and challenge yourself to be creative. The vintage door headboard looks nice. I agree that it’s a really cool way to make use of something that seems to be useless. I saw a coat hanger being made from a vintage door too. You might want to check that out also. Those doors look really old! But I think that its authentic vintage look adds a lot of character to the room because it is contrast to the modern bed.